I'd been planning to come back to Wreningham for a while. I'd last been here in May 2006, at the end of a frustrating journey through south Norfolk. As the poet Philip Larkin once observed of Coventry, it's not the place's fault. Wreningham, on a different day, would have been a splendid parish, I am sure. 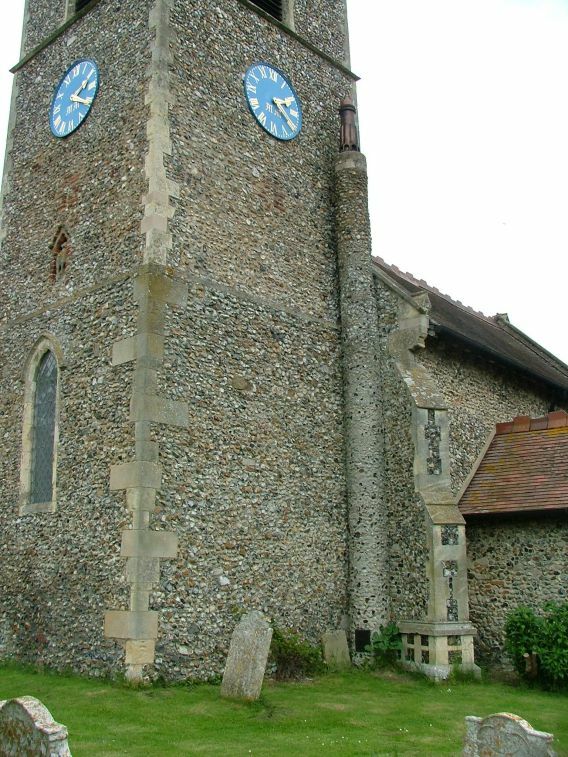 But Jacqueline and I had pursued a long, tortured route up from Long Stratton, and every single church we attempted to visit had been locked, with every single keyholder out. This was church number eleven. If I had been a more contemplative Catholic than I am, or a Buddhist perhaps, then no doubt I would have derived some benefit from this experience. 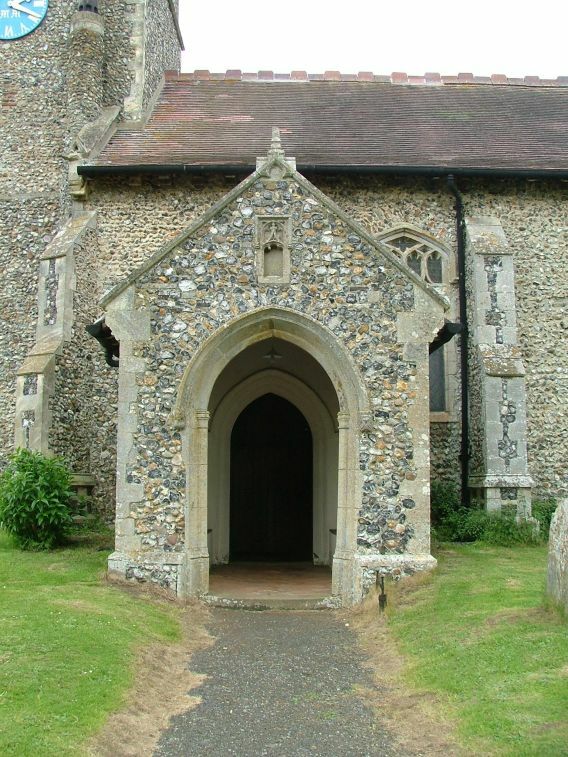 As it was, I simply observed "sod this, let's go to the pub in Wymondham instead", and so we did - and also to the two main churches there, both of which are open all day every day, bless them. 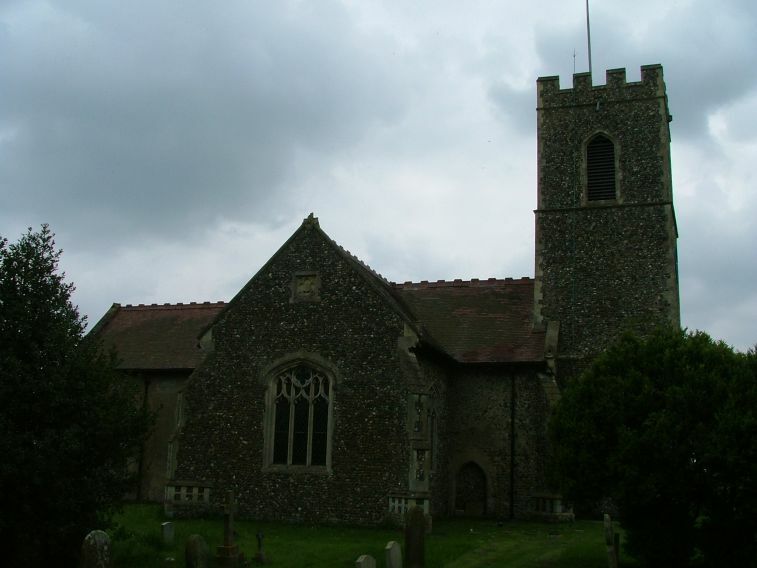 In March 2008, Peter and I set off again into the deceptively remote hills to the south-east of Wymondham. The villages out here straggle along windy lanes, the churches often small and set beside the road in tight graveyards. But it is an interesting graveyard at Wreningham, with a wealth of 18th century headstones. 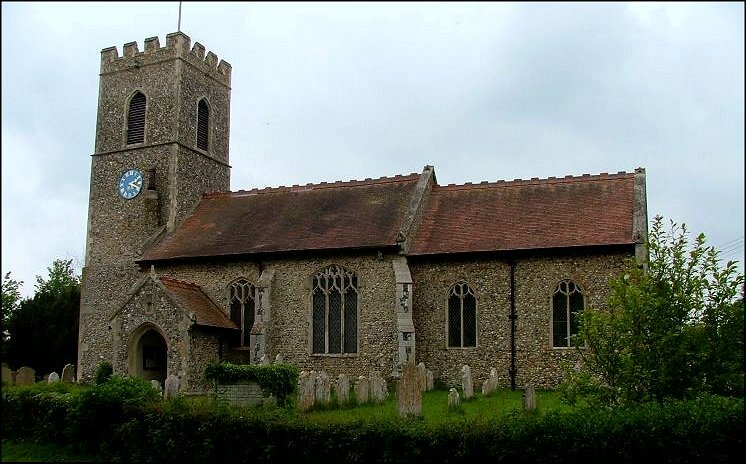 And a pleasant church, although entirely Victorianised, and probably looking pretty much now as it did in 1855 when it was considerably rebuilt after the tower collapsed. Money seems to have been no object, and after scratching his head for a while the architect appears to have suggested that they spend it on a wholly unnecessary north transept. There is a curious and rather charming chimney set against the south-east corner of the tower. Above it, the Millennium clock is a sign that we are no longer in the 19th century, or, indeed, the 20th. When Pevsner came this way in the 1950s, he was pleased to note the ivy that covered the church, but this has now gone, for better or worse. I went up the path to look at the keyholder's address, but the note I found pinned to the door did not bode well. This door has been left open on a number of occasions. Please make sure that you have locked it properly... it read. If I remind you that perhaps a thousand of East Anglia's medieval parish churches are open for business every day, you can imagine how my heart sunk when I read this. However, when we walked up the road to the cottage where the keyholder lived, she was very cheerful and friendly. "I've only just locked it, it's been open all day!" she laughed. Other writers have not found much to say about the interior of All Saints, and so I was not expecting great wonders. But in fact, the inside of the church is lovely. It is a trim, High Church restoration that has remained almost completely intact, with few later interventions. It really could still be the 1880s, I thought, as I stood there in the rich silence. You could go a long way to find a more aesthetically pleasing document of late 19th century piety, especially in such an intensely rural setting. A large display in the nave depicts an Anglican mission and school in a remote district of the country now known as Zimbabwe, which was started by the son of a Rector of this church in the 1890s. As was the way in those imperialist days, he called it 'Wreningham All Saints', and so it is still known today, a fascinating link between that troubled part of the world and this rural outback. The turn-of-the-century glass in the east window depicts the story of Christ calling the children, and it is done in an oblique style with lots of details which are worth a closer look. Pevsner wondered if it was by Heaton, Butler & Bayne. In the nave, there is a window commemorating Queen Victoria's Golden Jubilee in 1887. 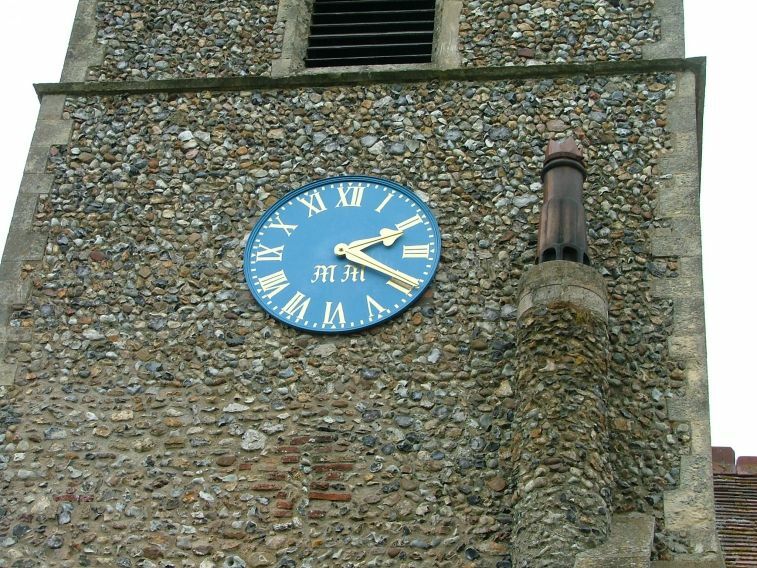 Several East Anglian churches have commemorations of the Diamond Jubilee a decade later, but I don't recall seeing this before. The floor is carpeted in green, and this is echoes by the curtain hanging behind the altar. All in all, it is simple and beautiful. One curiosity. Externally, you would have to say that this church was pretty much completely rebuilt. And yet, in the roof of the chancel there are what look like medieval angels, rather large and out of scale. In the shadowy gloom of a late winter afternoon, we nearly missed them. Are they survivals of the earlier building? Or did they come from elsewhere? Whatever, I was glad that we had got inside and seen them.